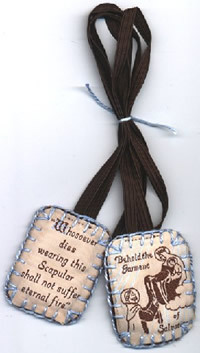 Wearing the Scapular indicates that you place yourself under the special protection of Mary. The church does not teach that wearing a scapular is some sure ticket to Heaven; rather, we must strive to be in a state of grace, implore our Lord’s forgiveness, and trust in the maternal aid of our Blessed Mother. 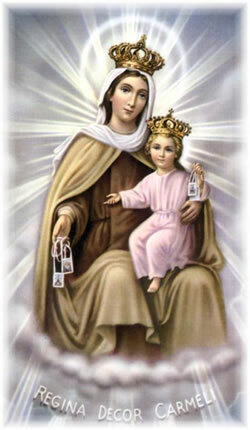 Devotion to Our Lady of Mount Carmel (the Madonna of the Scapular) began before the time of St. Simon Stock — even before the time of Jesus. In 8th century B.C., the great prophet Elias came down the holy mountain of Carmel in Palestine. Then he began a long tradition of contemplative life and prayer. He and his followers had mystically dedicated themselves to God’s Mother-to-come, Mary, Queen of Mount Carmel. Nearly three thousand years later, that tradition of prayer, contemplation, and devotion to Mary continues to live and be present in the Catholic Church.